Special Episode! 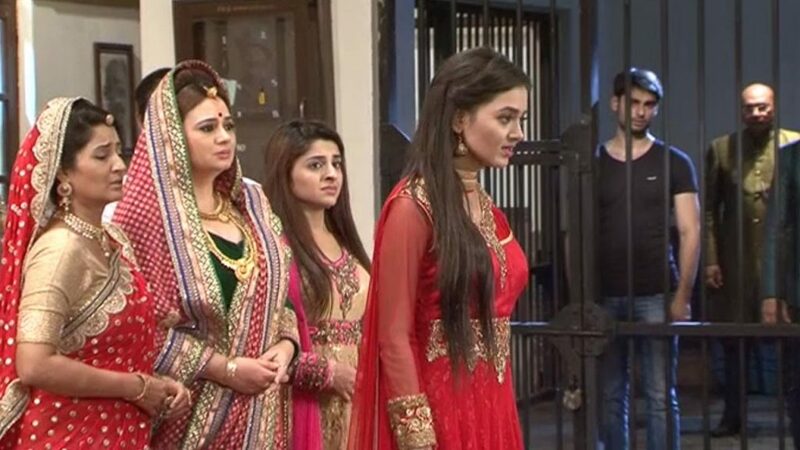 Swaragini 20th August 2016 Today Written Updates :- The show stars with Ragini checking the lockers and the blackmailer fell down, Ragini runs after him and when blackmailer was about to hit Ragini, Swara came there and hit him with a rod. Later, Ragini and Swara got shocked after knowing that the blackmailer is the elder brother of Sansar and Lakshay Adarsh. They asked him why did he do this. Adarsh told them evenly that why he should tell anything to them and he will kill their brother Chotu if they dare to tell their truth to anyone else. Then, Annapurna and Sujata came there and Adarsh thinks that they heard all his talk but she came there to check their keys. Later, Swara told them that they saw blood on Adarsh jacket and thus, asked him to give his jacket to him, so she will clean it. Swara asked for Adarsh jacket in which he had hidden all the jewelry and the papers. Then, Annapurna asked Adarsh to come with them for aiding his injury. Later, Swara and Ragini was in a kitchen and they were discussing Adarsh. Then, Adarsh came there and shown them a camera and warm, them if they dare to do anything wrong then he will kill his Chotu and he asked them to come in her room. Then, Adarsh told Swara and Ragini to get the sign on these paper for his father Durga Prasad. Swara says no, then AAdrsh told them that they will now remember their brother Chotu in memories. Ragini takes the paper. Next day, Durga Prasad asked Laksh and Sanskar that he need to sign this paper. Ragini put Adarsh’s paper in between all the documents and Durga Prasad signs it and asked Laksh to courier it. But, Adarsh says he will courier all these paper along with other paper. But Swara came, there and says stop. In the upcoming episode, Adarsh brings veiled woman(many be Parineeta) home along with a baby (Chotu). He tells Annapurna that he brought that woman and baby home for their safety. Swara and Ragini look at Chotu. They try to hold him and feel current. Adarsh threatens them that if they try to get the baby then he will die. They are shocked.